Knights of the Red Branch, the local branch of Clan na Gael. 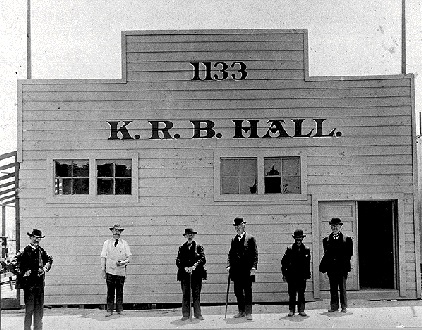 The photo is of the temporary KRB Hall built soon after the 1906 Earthquake and Fire at 1133 Mission Street. This temporary structure was the third KRB Hall. It was replaced by a permanent hall finished in 1909, financed by the sale of KRB Hall Association Bonds. The KRB Hall burned down on December 18, 2007. After the 1906 Earthquake and Fire, a temporary Irish community center was located at 1133 Mission Street. Known as the Knights of the Red Branch, it was replaced by a permanent hall finished in 1909. The new hall was designed by local architects Frank T. Shea and John O. Lofquist in the Norman Irish style. The center was frequented by recently immigrated and SF-born Irish, with roots all over Ireland. According to stories, the KRB was three or four stories tall with a bar on each of the floors. Apparently the center never filed for a liquor license and managed to remain open during Prohibition. Over the years it was a place for regular folks, firemen and police, even the Mayor and Supervisors to meet. One SF resident wrote a collection of stories from over 94 interviews of people who used to frequent the KRB. 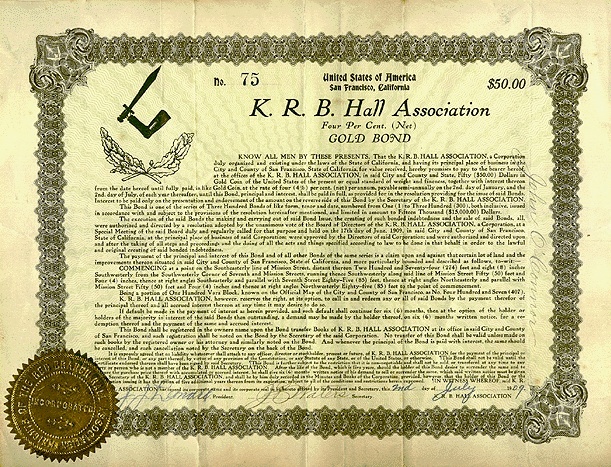 $50 gold bond issued by the Knights of the Red Branch Association.